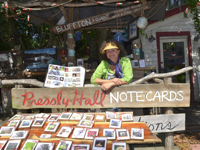 Entertainers and vendors promise to provide an electric atmosphere as they celebrate art, community and Bluffton fun. Organizers expect close to 10,000 guests as well as 200 vendors from South Carolina and all over the South, offering unique arts and crafts and delicious food. Some of the diverse goods for sale include jewelry, sweet grass baskets, ironworks, print and original artwork, quilts, glass art, pottery and more. Food vendors will offer choices ranging from Lowcountry favorites such as the festival’s famous shrimp salad sandwiches and barbecue to traditional festival food such as funnel cakes, crepes and Italian ice. 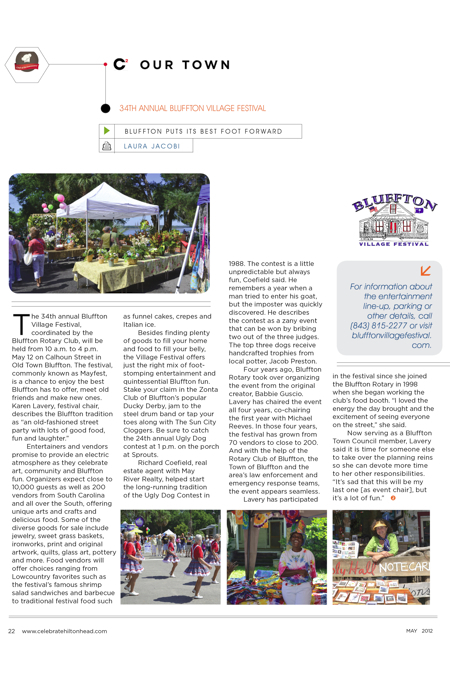 Besides finding plenty of goods to fill your home and food to fill your belly, the Village Festival offers just the right mix of foot-stomping entertainment and quintessential Bluffton fun. Stake your claim in the Zonta Club of Bluffton’s popular Ducky Derby, jam to the steel drum band or tap your toes along with The Sun City Cloggers. Be sure to catch the 24th annual Ugly Dog contest at 1 p.m. on the porch at Sprouts. Richard Coefield, real estate agent with May River Realty, helped start the long-running tradition of the Ugly Dog Contest in 1988. The contest is a little unpredictable but always fun, Coefield said. He remembers a year when a man tried to enter his goat, but the imposter was quickly discovered. He describes the contest as a zany event that can be won by bribing two out of the three judges. The top three dogs receive handcrafted trophies from local potter, Jacob Preston. Four years ago, Bluffton Rotary took over organizing the event from the original creator, Babbie Guscio. Lavery has chaired the event all four years, co-chairing the first year with Michael Reeves. In those four years, the festival has grown from 70 vendors to close to 200. And with the help of the Rotary Club of Bluffton, the Town of Bluffton and the area’s law enforcement and emergency response teams, the event appears seamless. Lavery has participated in the festival since she joined the Bluffton Rotary in 1998 when she began working the club’s food booth. “I loved the energy the day brought and the excitement of seeing everyone on the street,” she said. For information about the entertainment line-up, parking or other details, call (843) 815-2277 or visit blufftonvillagefestival.com. Line in the Sand: Why the rush?